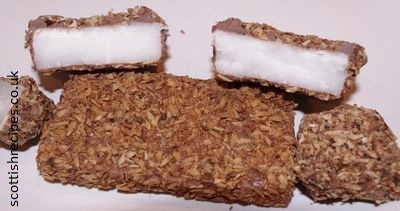 These are a popular sweet in Scotland made from vanilla filling and chocolate and coconut topping. The more traditional Scottish macaroon bar recipe would have used potatoes, icing sugar, melted chocolate and toasted desiccated coconut and be eaten fresh. There is an example in the Maw Broon's Cookbook . Bakers throughout Scotland sell an assortment of cakes made from coconut. It is possible to buy the sweetie bars from online retro sweet shops. Lees are popular in shops and in some regions The Toffee Man franchise of door to door selling sweets still sell them. The book A Cook's Tour of Scotland by Sue Lawrence has a traditional macaroon bars recipe using potatoes, icing sugar, chocolate and desiccated coconut. They are also available in a wide range of filling flavours such as strawberry and raspberry.